Thordon Bearings, of Burlington, Ontario, Canada, has received an order to supply four comprehensive shipsets of stern gear for a new class of towboat. The four boats are being built by US shipyard Master Marine of Bayou La Batre, Alabama, for Waterfront Services, based in of Cairo, Illinois. The new vessels have been designed to meet the requirements of Subchapter M, a set of federal rules recently introduced by the US Coast Guard, relating to the inspection requirement for towboats, including seaworthiness standards and safety protocols. The 20 m x 8.5 m boats, each powered by twin S6R2-Y3MPTAW Mitsubishi diesel engines, rated at 599 kW at 1,400rpm, will drive 70in x 48in x 7in four-blade, stainless-steel propellers through Twin Disc MG 5321 gearboxes with 5:1 reduction ratio. Thordon has been contracted to supply its RiverTough propeller shaft bearings for a 6in diameter shaft, along with hardened shaft sleeves, SXL bearings for main and flanking rudders, TG100 tailshaft seals, and happy to be teaming up with Waterfront Services to provide these latest fleet boats with the best heavy-duty equipment available that’s capable of meeting Subchapter M requirements,” he added. The first two vessels in the series, Miss Deborah and Tom Toretti, have already been handed over, in October 2017 and January 2018, respectively. The remaining two, Sam P. Hise and Rick Pemberton are scheduled for delivery in April and July 2018. Thordon’s RiverTough water- lubricated bearings were developed specifically for use in abrasive-laden dirty water such as that found in the Mississippi River system. When used in combination with hard-coated nickel- chrome-boron (NiCrB) shaft sleeves and a TG100 shaft seal, the arrangement can last twice as long as the rubber bearings. The TG100 tailshaft seal uses high- quality, hard wearing silicon carbide faces and Thordon’s proprietary elastomeric polymers to offer the optimum combination of strength/stiffness and flexibility/elasticity. The seal requires no routine maintenance, and although designed for abrasive conditions, it is equally at home in clean water. ThorPlas-Blue bearings, designed for a life-time of grease-free lubrication, are typically specified to replace the greased bronze bearings in virtually all steering and deck machinery applications. Since these bearings require no maintenance, the commercial advantages are obvious. “Thordon’s range of river towboat systems offers outstanding wear life in abrasive waters. Any extra up-front cost is quickly offset by longer wear life and reduced main- tenance down time over the life of the vessel,” said Bright. Bearings is renowned for supplying high performance, oil and grease-free bearing systems to the global marine, clean energy, pump and offshore markets. 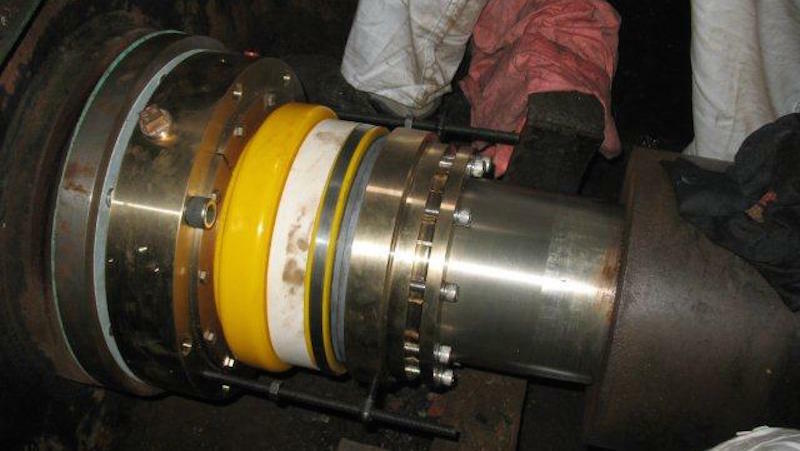 Thordon Bearings is the only manufacturer of propeller shaft bearings to guarantee its award-winning COMPAC system for a 15-year wear-life. Thordon systems and bearings are available worldwide through over 80 agents and distributors. ThorPlas Blue steering linkage bushings. “These are fleet boats, operating virtually 24/7 on the Mississippi River,” explained Jim Bright, Thordon’s USA Business Development Manager. “They are operating in very abrasive water conditions, frequently running close to the river banks in shallow depths.